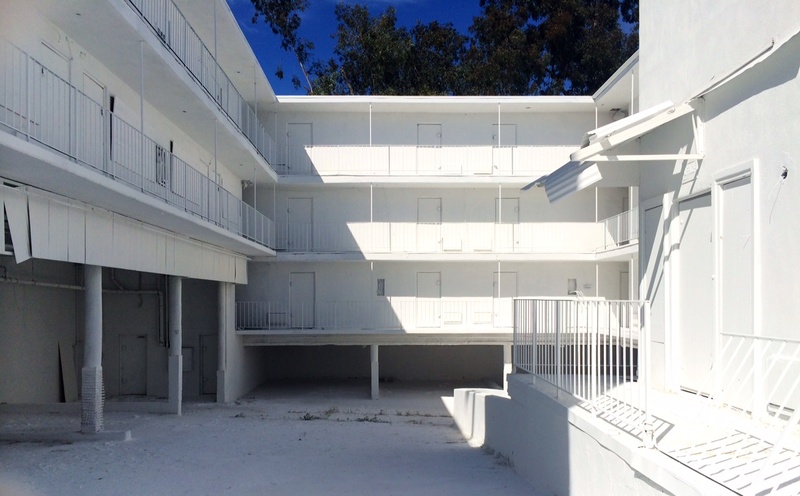 Everyone in town is talking about the curious new public art installation by French artist Vincent Lamouroux, “Projection,” at the Sunset Pacific Motel on Sunset Boulevard in Silverlake. 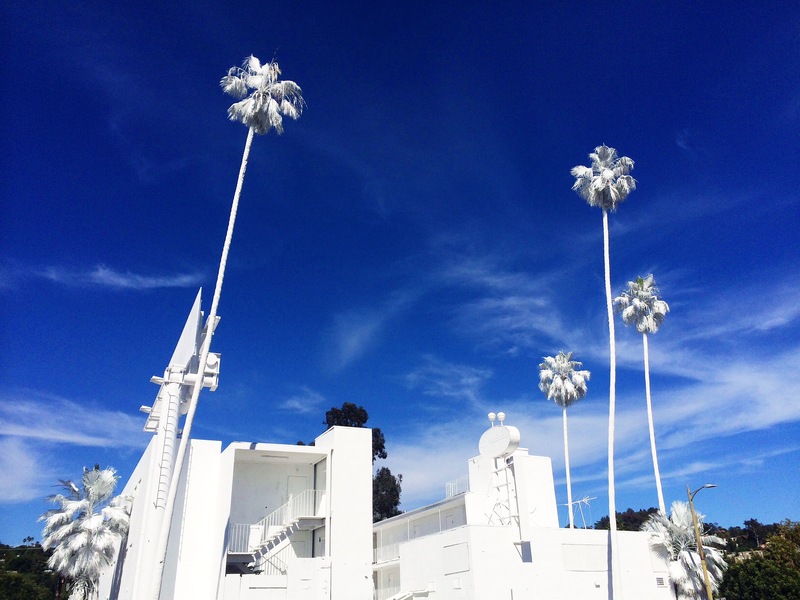 For Projection, Lamouroux has covered the entirety of the infamous, decaying motel and its grounds in a lime-based whitewash – including, most charmingly, four palm trees on the property that stretch into the iconic blue California sky, begging to be photographed and uploaded with the hashtag: #ProjectionLA. The seedy motel, locally known as The Bates Motel, has a sordid past filled with the stuff of movies – prostitution, drugs, and murder. Scheduled to be demolished in a year, Lamouroux’s thin veil of purity covering the motel won’t, and isn’t designed to, last forever. The eco-friendly whitewash will eventually disintegrate, and after security detail ceases on May 10, 2015, the inevitable will occur – graffiti and other projections of our own creative desires will soon make their mark on this blank canvas, a brilliant city-wide artistic collaboration, before it turns to dust. The freshly dressed motel is a welcome, unexpected surprise, its unadulterated facade upsetting the sea of neon and billboards synonymous with Sunset Boulevard; a whimsical hiccup in the everyday experience of Angelenos. The silence, you might say, is deafening. Still, what I find most intriguing about this public art installation is the heavy symbolism inherent in the act of whitewashing – a loaded venture that can take a negative or positive spin. Smartly, Lamouroux’s Projection speaks to both sides of the coin. On one hand, whitewashing can act as purifying force for good; a fresh start covering an imperfect past. Indeed, whitewashing a squalid motel so that it might become a projection screen for a city full of dreamers armed with cameras has been instantly embraced by a generation of “upcyclers”. This location, once an eyesore, has become an interactive mecca for the creatively inclined. Yet, whitewashing is also brimming with negative connotations. Over-gentrification is a problem that has been plaguing Los Angeles for years, and doesn’t seem to be getting any better. Some might interpret Projection as a hasty method to cover up undesirable evidence of a low socio-economic history for a new crowd with sophisticated aesthetic expectations. Silverlake, Los Angeles’ most hip, newly gentrified neighborhood and home to Projection, hosts this cultural consumer in droves. 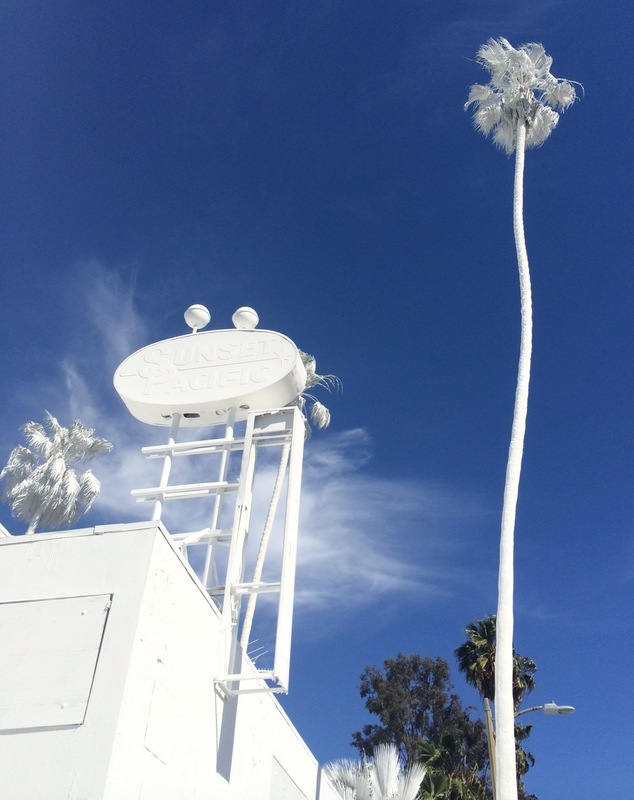 Check out Vincent Lamouroux’s Projection at 4301 Sunset Boulevard, Los Angeles.